One Life Lost is One Life Too Many. This is the battle cry of the GIST Cancer Research Fund and we won’t stop fighting until a cure is found. We find hope and consolation in the fact that our GIST Cancer Doctors and Researchers are feverishly working to find out why these cancer cells mutate and ways to permanently destroy them. However, we still have to face the reality that GIST patients are dying and we are all deeply saddened by the loss of those brave people who were unable to win their battle with GIST. This space is dedicated to celebrate all the lives lost by GIST Cancer. Some stories can’t be told because the loss is so great. In any case, when you see the names or read the stories, take a moment for a thought or prayer in their honor. If you wish to make a donation to GCRF in honor of someone please click on DONATE. Please indicate by a separate email to GistCancerFund@aol.com if you want the donation to be mentioned and any comments that you would like to make. 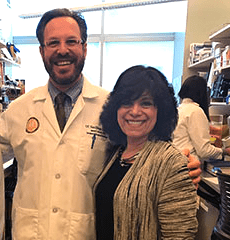 The GIST Day of Learning in Orange County introduced to her Jason Sicklick, M.D., who leads the research on the rarer form of the disease afflicting Melikian’s son at UC San Diego. Dr. Sicklick took her son on as a patient at the Moores Cancer Center at UC San Diego. In August 2016, her son underwent a third operation, this time at UC San Diego with Sicklick in charge. “He removed over 50 GIST tumors in a nine-hour operation. He was heroic that day, and so was my son. Dr. Sicklick saved my son’s life, and I am forever grateful. Dr. Sicklick was successful that day, but we remain realistic. His disease will eventually reoccur and progress. Without more research and drug development, there will be few therapies to offer." Laurel Karsa, a strong and inspirational artist, mother, and loving friend, was called to her heavenly home in June of 2016 at the age of 59. Growing up in Minnesota as the third of six kids, she helped care for her younger siblings and was involved in sewing and singing in her church choir from a young age. She and her first husband raised four children, who were her pride and joy. Always a dreamer and an artist, Laurel had her own business creating porcelain dolls, teaching doll-making classes, and sculpting her own award-winning dolls. In her 40s, she pursued her lifelong dream of going to college, eventually obtaining both her bachelor’s and master’s degrees. In 2005, Laurel was diagnosed with GIST cancer. 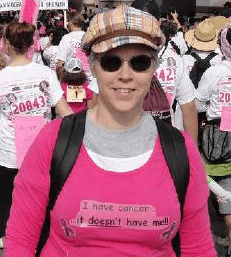 Over the next 11 years, she bravely battled through a major surgery to remove the initial tumor, countless treatments, medications, procedures, hardships, and chronic pain, carrying the burden of her illness with grace, dignity and humor. After her cancer diagnosis, Laurel’s art become more than just a hobby; it was her passion and saving grace. She spent countless hours painting, drawing, writing poetry, sewing, embroidering, arranging flowers, marbling, wood-carving and creating multimedia projects. Through art, she was able to transform her pain into beauty, which echoed running themes throughout Laurel’s life: finding beauty in the ugly, and loving the unlovable. Her kids will always remember her teaching them to be accepting and loving toward all, as well as her unconditional love and support for their hopes and dreams. Throughout her poetry and art, dandelions and butterflies were often central themes, signifying strength, beauty, hope and transformation. Laurel loved spending time with her seven grandkids, snuggling, reading, attending their events, teaching them about art, and creating special keepsakes for them. Laurel spent the last years of her life with a man who wholeheartedly loved and supported her and highly encouraged her artistic endeavors. Committed to being each other’s life partners, together they shared much joy and companionship, spending time with their dog, going to art shows and community events together, and traveling in their RV. Laurel will always be remembered for the immense beauty she brought to earth: her amazing talent, her boisterous and contagious laugh, her amazing resilience and strength, and her accepting and loving spirit. Those who knew her were richly blessed, and she will surely continue to bless us in heaven, as she joyfully sings and creates masterpieces as an angel, free of pain and full of joy and laughter.